Often, we are concerned about the polluted air outside that we feel at home is the safer place. Hardly do we know, the indoor air contains more pollutants compared to the outdoor atmosphere. How do you know? If you are constantly suffering from dust allergies, runny nose, sneezing, coughing, fever and none of these seem to stop without medical assistance. The main reason for such health issues is breathing and living in a polluted indoor premise. Perhaps you already know that an air purifier can rescue you from this situation. However, not all air purifiers seem to be effective for improving indoor air quality. You need to find the most suitable air purifier for your residence or office to get the utmost breathable air. Before you buy one for you, it’s important to know what this device actually does. Now, let’s find out what does an air purifier do to improve the indoor air quality. The purpose of designing an air purifier is to capture and evacuate all types of airborne pollutants from the atmosphere than any other cleaning devices fail to do so. When you dust off or deep clean the house, apparently you remove the contaminants from the tabletop, furniture, sofa and so on. But, after a while, you notice dust covers all the surfaces again. Why? Because, through the cleaning process we remove the dust from these places, later they float in the air. This is why the air purifier is used. The prime reason for using an air purifier is to capture and pull out the airborne pollutants. Our indoor atmosphere contains different sizes of mold, pollen, dust, dirt, smoke, pet hair, dander, and other tiny particles. When an air purifier is installed in a room or car, it can effectively evacuate these pollutants from the indoor premise. Whether we are working on our kitchen or living with a pet at our home, odor becomes unbearable at some point. It becomes even more irritating when the smoke odor adds to the atmosphere. Some of the air purifiers include carbon filter or ionizer to remove such unpleasant odor along with the pollutants from the house. Our indoor air mostly includes biological pollutants. Sometimes, the gaseous pollutants may add in when someone smokes, the house gets new paint, using cleaning materials and many more. Such gaseous elements contain volatile organic compounds (VOCs) or chemical pollution. Since gaseous pollutants cause toxic smell and tiny particles, the air purifiers are specially designed with activated carbon. Additionally, they come with a gas indicator. So, whenever there is any existence of gas in the air, the device will detect the pollutants and work immediately to remove them. There is a wide variety of air purifiers with exceptional features available in the market. Among them, the HEPA air purifiers are commonly used. Our air contains tiny sizes of pollutants along with germs, bacteria, and allergen that are detrimental for our health. Most of these pollutants are unable to see in naked eyes, hence, we fail to clean them from the air. However, HEPA also known as high-efficiency particulate absorber air purifier has been proved to evacuate 0.3-micron sizes of particles. 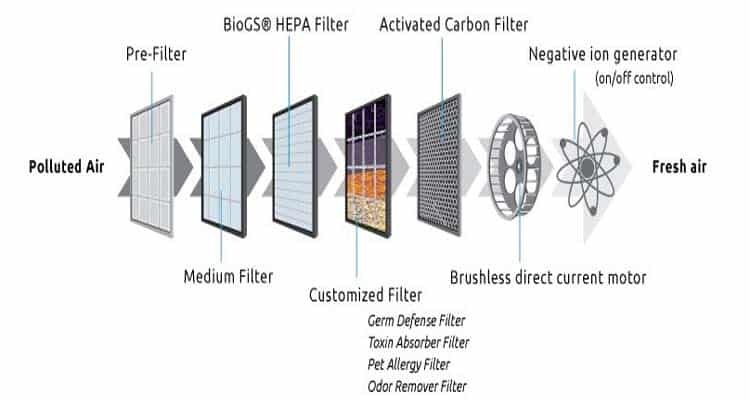 So, the HEPA air purifier with an antibacterial filter will not only remove the pollutants but also kill the germs, bacteria, and source of allergens successfully. When you constantly live and breathe in polluted air, allergens, bacterial infection, sneezing, skin rash etc. tend to attack more frequently. But, once you start using an air purifier for your home, office or car, eventually you will see a noticeable change in the air. It’s natural that the fresher air you breathe in, the better your lungs will function. If you are suffering from asthma, allergies or breathing problem, you will definitely see a remarkable improvement in our respiratory system. After a certain period, you will get a strong immune system. Even though an air purifier can remove any tiny particles of pollutants from the indoor atmosphere, remember that it’s not a replacement device for cleaning. However, you will definitely feel the necessity of cleaning the house has reduced. As you start using the device, you may realize some additional advantages. To understand profoundly what an air purifier can do, it’s important to learn how the device functions. Here it is! As mentioned earlier, different air purifiers come with unique features and filtration system. However, the basic system is common in all. An air purifier consists of filters and fan. The fan pulls in the indoor air inside. Then, the air passes through each filter and the pollutants are separated from the air. In one way, the device removes the pollutants from the air, and on the other, it sends back the fresh air in the atmosphere. Whenever the air gets polluted, the device becomes active to clean up the air. It’s a continuous process and most of the devices run automatically. So, the user doesn’t need to face the hassle or turning it on and off every time. We hope, you have understood what does an air purifier do and how beneficial it is for a closed atmosphere. If you are still confused and not convinced if the device is going to be worth it, you can also read the article on “How air purifiers will help you” on this website. There are many types of air purifiers available at different prices out there. If you are interested to purchase, you can choose your ideal air purifier from the 10 best HEPA air purifiers on the market. Here, we have recommended you the top rated air purifiers that are proven to give you the utmost pollutant-free indoor air. Hope the article has been helpful for you. For more information or if you have any queries, leave your comment below and we will try our best to answer.